Hello there! For my regular readers, welcome to day 15 (part 2) of Blogtoberfest 2014, and if you are new here as part of the Aussie Aviatrix Quiltalong, it’s lovely to see you! 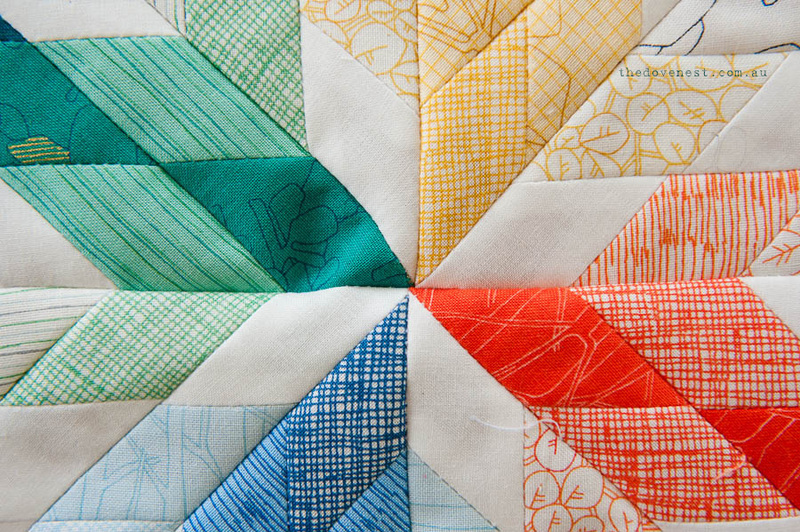 If you’ve blogged about your own Aviatrix quilt. why not join in the Aussie WIP Wednesday and show it off? Today, I’m excited to be kicking off the sewing portion of the quiltalong, and sharing with you my centre medallion. I am using a fat quarter bundle of Botanics by Carolyn Friedlander, with a Moda white as my accent (it’s a very slightly off white), and a grey tone-on-tone I found at my LQS for the background. Now. I have a little confession to make. I am a Lazy-with-a-capital-L quilter, and I was very naughty and did not mark the cut pieces as the pattern suggested. I just overlapped my ends by 1/4″ (which I eyeballed. Yep. Lazy) and hoped for the best. It does mean some of my diamonds don’t line up as well as they should, but I can live with that – unlike this little mix-up I discovered AFTER I’d trimmed the block to size. And yes, I felt like crying. My plan is to unpick the bare minimum to removed the two switched pieces and turn them before handstitching back into place to avoid shifting the seams as much as I can. My “hope for the best” method turned out ok, aside from one little bubbly wonky spot at the centre of the star, but it’s not overly noticable, so I’m hoping a combination of whacking it with the steam and then the quilting will be enough to settle it. 1) PAY ATTENTION to the cutting instructions. I presumed “colourful fat quarters” referred to all the prints, and merrily cut away…including my grey fat quarters. While thankfully I had only cut the first strip to get enough for my medallion, it is still going to be quite tight, and I may end up with a few substituted pieces. Upon further review, the grid page actually does label them “colourful fat quarters” and “neutral fat quarters”. So READ THE PATTERN FIRST, and don’t be a goose like me, ok? 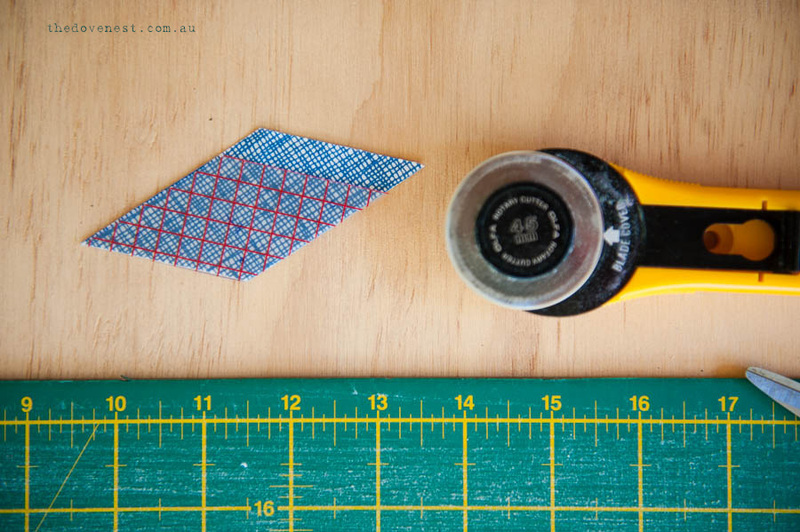 2) If you are using gridded template plastic, and lining up the grid, don’t forget to remove the edge outside the grid before cutting. It could save you some extra trimming time. So I’m told. 3) When I was assembling the 8 triangles into quarters, and then quarters into halves, I knew I would be dealing with some slight variances. 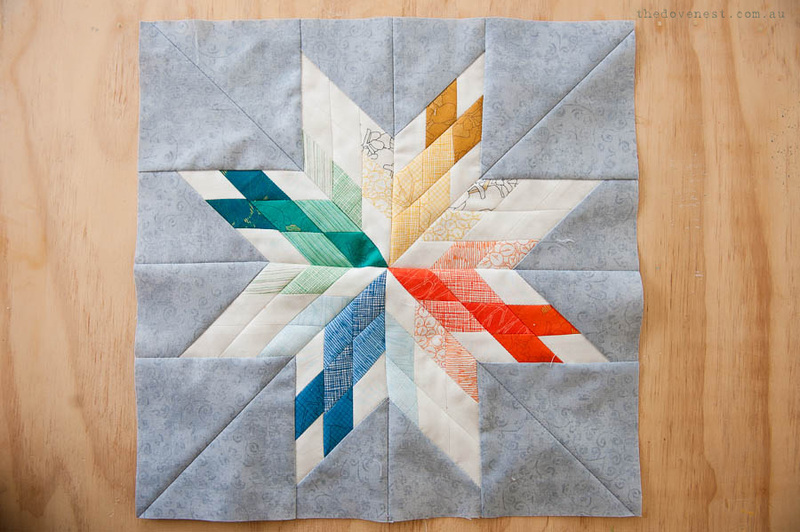 To preserve the sharp silhouette of the star, I lined up the seam between the star and background, and pinned it in place. I then started sewing from that seam to the outside, before flipping and carefully lining up the pieced star and sewing that seam. This meant my background corners were nice & neat. 4) I used a similar method for joining the two halves together – I first pinned the centre seams together, and then the two background seams. I sewed from the background joins to the outside on both sides, and then very carefully, easng in any fullness as I went. sewed the centre of the star together. How is your medallion going? Have you started? Are you a few rounds ahead? The next stop on the quiltalong will be back with Linden on October 27. That gives me two weeks to do the next border – the should be plenty of time. Shouldn’t it? thanks for the tips – always nice to learn from other’s experience !!! 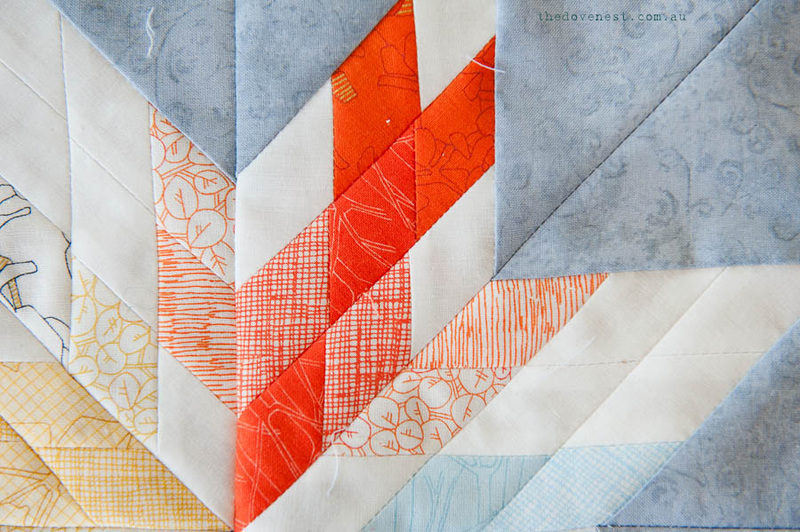 love your choice of fabrics – its going to be a really pretty quilt !! Lovely job and excellent tips Rachael. Sadly I’m still cutting but will be heading your warning about the greys/neutrals. Yes, hopefully not everyone is as silly as I! Happy cutting – I need to get busy on the rest of mine too.